Today SF State Professor of Biology John Hafernik and colleagues from the SF State Department of Biology and the Center for Computing for the Life Sciences launched ZomBeeWatch.org, a citizen science project to report possible sightings of the parasitized bees. After being parasitized by the Apocephalus borealis fly, the "zombees" abandon their hives and congregate near outside lights, moving in increasingly erratic circles before dying. The phenomenon was first discovered on the SF State campus by Hafernik and colleagues, and reported last year in the research journal PLoS ONE. The ZomBeeWatch site asks people to collect bees that appear to have died underneath outside lights, or appear to be behaving strangely under the lights, in a container. They can then watch for signs that indicate the bee was parasitized by the fly, which usually deposits its eggs into a bee's abdomen. About seven days after the bee dies, fly larvae push their way into the world from between the bee's head and thorax and form brown, pill-shaped pupae that are equivalent to a butterfly's chrysalis. If it looks like their sample contains hatched parasites, "zombee hunters" can upload photos of their sample's contents to confirm whether they have found a parasitized bee. 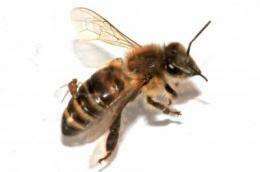 Along with information about the location of the photographed bee, the images will help the scientists build a better map of the honeybee infection. ZombeeWatch offers tutorials on how to become a zombee hunter, complete with step-by-step instructions for monitoring and collecting bees, building a light trap and uploading data. 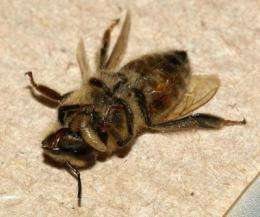 Although there have been other reports of parasitized bees in Redwood City, Santa Barbara and South Dakota, Hafernik said, "what we'd really like to see is if this parasitism is distributed widely across North America." Hafernik says he has timed the launch of the site for when the parasitized population begins its seasonal rise. "Right now is still the low season for parasitized bees," he explained, "but they will start ramping up in August. In the San Francisco Bay Area, infections peak in September through January. We hope to learn about the timing of infections in other areas of North America." Since last year's report, Hafernik and his colleagues have embarked on an ambitious set of experiments to learn more about the plight of the infected honeybees. In one key project, the researchers, led by graduate student Christopher Quock, will tag infected bees with tiny radio frequency trackers to monitor their movements in and out of a specially designed hive. They hope the tracking system will tell them more about how the infection affects the bees' foraging behavior and why they eventually abandon their hives. Hafernik and his collaborators are eager to learn as much as they can about the parasite, since it may be an emerging and potentially costly threat to honeybee colonies, especially those that cross from state to state to be used in commercial pollination. The researchers hope the intense public interest in the parasitized bees earlier this year will encourage people to visit and contribute to the ZomBeeWatch site. "We're sort of a mom and pop operation at this point," Hafernik said, "but if we can enlist a dedicated group of citizen scientists to help us, together, we can answer important questions and help honeybees at the same time."